Ten states have already eliminated the requirement that gun owners obtain a permit before carrying a firearm in public. In mid-February, New Hampshire became the latest to join the club. More states may soon follow. 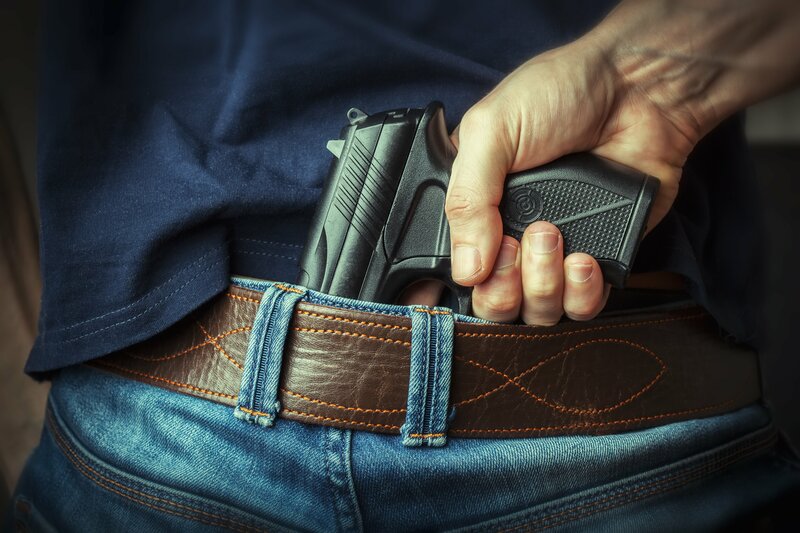 Lawmakers in at least 20 states, including Indiana, Montana, Utah, Kentucky, Tennessee, Texas, and the Dakotas have introduced constitutional carry bills. For gun-violence watchdogs, the movement represents a massive erosion of public safety and responsibility; for gun-rights advocates, it’s a restoration of rights as the founding fathers understood them. How does constitutional carry work, where does it come from, and where is it headed? Some of the answers might surprise you. Here is an explainer on the movement and its broader context. Constitutional carry is the chief term gun-rights advocates use to describe the freedom to carry a firearm, openly or concealed, anytime or anyplace, without government licensing, registration, or training. What’s so constitutional about it? Proponents of constitutional carry argue that the founding fathers intended the Second Amendment to give individual citizens a right not just to own firearms, but to carry them anywhere. On this view, virtually all gun-licensing programs and constraints on carrying guns are unconstitutional, and approving the carrying of firearms without a permit is a restoration, not an expansion, of Americans’ individual rights. Likewise, any discussion of whether a proposed gun regulation could save lives or prevent disasters is moot if the regulation is unconstitutional on face. How is this different from regulations we have today? Beginning with Florida in 1987 and ending with Illinois in 2013, every state has enacted legislation to permit the carry of concealed firearms. Most, however, require carriers to obtain a license, and along with it, proof of firearms knowledge or hands-on training. Kentucky, for example, requires “actual range firing of a handgun in a safe manner,” proving an applicant can put 11 out of 20 shots on a paper silhouette target, to be licensed. Illinois requires at least 16 hours of firearms training. The National Rifle Association and other gun rights groups fought for most of these licenses and screening standards. In recent years, though, gun lobbyists have fought to expand gun owners’ immunity from prosecution and litigation arising from the use, display, or carry of their weapons — from the castle doctrine to stand your ground to, now, constitutional carry. The latter concept relieves gun owners of most existing proficiency requirements and screening standards: If they can pass a background check to obtain a firearm, they can carry it — no license necessary, no questions asked. Where is constitutional carry legal? Why is constitutional carry making news now? There are two big reasons. First, the Supreme Court’s District of Columbia v. Heller decision in 2008 was the first time the federal government concluded that the Second Amendment confers an individual right, not simply a collective “militia” right, to own guns. But Heller didn’t address whether that right stops at your front door. So carrying a firearm in public became the new focus of debate on gun regulation. Second, right after Heller was handed down, Barack Obama became president. The Obamacare battle in Congress, the Tea Party movement, and opposition to Obama’s agenda led many of his critics to seek protection from what they saw as federal overreach. Constitutional carry became a rallying cry for many gun activists. That activism has translated into a legislative push across many parts of the United States. Who’s behind the campaign for constitutional carry? As the Trace has reported, the push for constitutional carry is coming largely from grassroots, state-level gun activists who are moving faster than the NRA. The NRA has been happy to push for the passage of constitutional carry laws in its press releases and blog posts, but in at least one state — Tennessee — local Second Amendment activists fume that the NRA gave political cover and coveted campaign endorsements to three Republicans who helped kill a constitutional-carry bill in committee last spring. State-level groups, by contrast, are sharing information on their constitutional-carry successes and getting aid from right-leaning Beltway conservative groups like the Leadership Institute and the Foundation for Applied Conservative Leadership, which have strong ties to national gun groups to the NRA’s right, including Gun Owners of America, the Second Amendment Foundation, and the National Association for Gun Rights. Who is fighting against constitutional carry? Gun-control groups and many political leaders in states with strict firearm restrictions are strenuously opposed. Some Republicans have also been hesitant to support the dismantling of gun-permitting requirements. Governor Gary Herbert of Utah vetoed a constitutional carry bill passed in 2013, and is threatening to do the same to a proposal now advancing through the state legislature. “As a State, we must exercise extreme care that we not impose undue burdens on the right to bear arms, but I have yet to receive any credible evidence that Utah’s current permit process constitutes a hardship,” he wrote after the 2013 veto. I don’t live in any of those places. Could it affect me? It could. In addition to the states listed above that are considering legalizing constitutional carry, President Donald Trump’s administration is likely to push for legislation advanced by the NRA that would require every state recognize the right to carry of residents from other states. Under that plan, for example, a gun owner from Mississippi — a constitutional-carry state — would be allowed to walk down Manhattan’s Fifth Avenue with a concealed weapon. In New York, the bill has drawn fire from opponents across the ideological spectrum. Attorney General Eric Schneiderman, a Democrat, told The Trace that such a law would “undermine the core principles of federalism, the traditional police powers of state governments, and the safety of law enforcement officers across the country.” On February 23, the conservative New York Post editorial page declared that Congress would be “insane” to pass the bill. Adam Weinstein is a Florida-based writer, editor, veteran, and lifelong firearms collector. He has also written for Esquire, GQ, Gawker, The New York Times, Mother Jones, and The Village Voice.